You can create your own brush styles. A variety of brush styles are provided allowing you to create and save your own.This way you can create brushes with precise sizes and parameters and save them so you can draw and design. 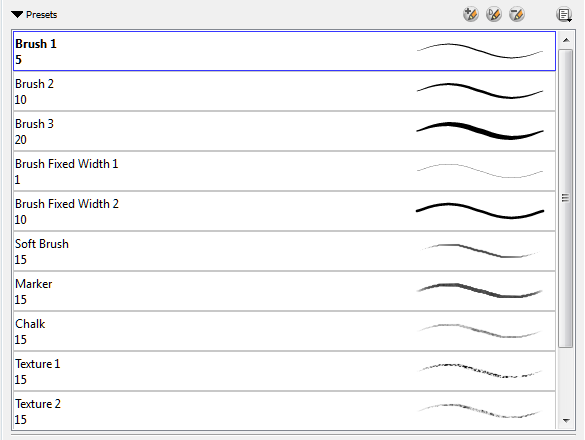 • In the Tool Properties, select a brush style from the Brush Presets section. Make sure your current brush has the settings you would like in your preset. ‣ In the Brush view, click the New Brush button. ‣ In the Properties window of the tool you are using, click the button in the upper-left corner—see Viewing Tool Properties. 2. In the New Preset window, type a name for your new brush preset. The new brush is added to the end of the list of brush preset. Brush presets cannot be updated. However you can select a preset, which applies those properties to the current brush. Then you can modify the properties, and create a new preset with the new properties. If desired, you can delete the old preset. Renaming a brush can make it easier to identify and access the brushes you use most frequently. 1. In the Tool Properties view, select a brush to rename. 2. From the Brush menu, select Rename Brush. 3. Type in a new name for the brush. 1. Select the brush preset you want to delete. ‣ In the Brush Preset view, click the Delete Brush button. ‣ From the Brush Preset menu , select Delete Brush.